With the Final Four teams (Chicago, Los Angeles, Pittsburgh and Boston) vying for the Stanley Cup, EA Sports has revealed the North American pre-order offers for NHL14. Gamers can get the EA Sports Ultimate Pass (in which consumers will receive access to 24 Hockey Ultimate Team Gold Packs – awarded one per week for 24 weeks), plus additional retailer specific offers. 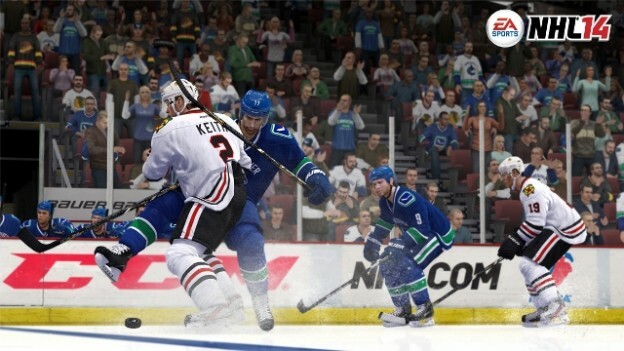 NHL 14 will be available for the Xbox 360and PlayStation3 on September 10, 2013 in North America. Kick start your Hockey Ultimate Team experience with the EA SPORTS Ultimate Pass, available to everyone who pre-orders EA SPORTS NHL 14. Hockey Ultimate Team is the fastest growing game mode in the NHL franchise, where over 800,000 users have created teams and more than 20 million games have been played. Origin - Official Goalie Player Pack – featuring goalie boost items. GameStop\EB Games - Exclusive FatHead NHL Sticker Sheet, plus two additional bonus offers to be announced at a later date. Best Buy/FutureShop - Official Easton Player Pack – featuring custom Easton equipment, and boost items. Amazon - Official Warrior Player Pack – featuring custom Warrior equipment, and boost items. Official CCM Player Pack – featuring custom CCM equipment, and boost items.